Couple Tour V1 - Have chendol will travel! The thirst quencher.. Bicycle Touring routes taken during my 2D/1N trip to Pasir Gudang, Johor. We spend the night at Sungai Layang off Johor Straits. These were the routes we took for home run. Bicycle Touring routes taken during my 2D/1N trip to Pasir Gudang, Johor. We spend the night at Sungai Layang off Johor Straits. Bicycle Touring routes taken during my 3D/2N trip to Bandar Tenggara, Johor. The returned routes to Ulu Tiram via Kota Tinggi. We stayed a night at Ulu Tiram before going back home to Singapore. Bicycle Touring routes taken during my 3D/2N trip to Bandar Tenggara, Johor via Skudai & Kulai. Singapore to Telok Chempedak, Kuantan, Pahang, Malaysia. 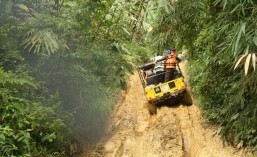 Telok Chempedak, Kuantan, Pahang to Kuala Rompin, Pahang. From 31 Jan 2014 to 8 Feb 2014, together with my Bicycle Touring “kakis”(friends), went for a 9 days tours from Singapore to Kuantan, Pahang, Malaysia and back to Singapore. It was my first ever 700 km ride … I definitely learnt lots of new tips and gained more experience during the trip… Managed to explore new routes recommended by fellow biketouring FBians … and the power of listening to their recommendations … As per recorded, I clocked in 736.3 km in total. These are our daily schedules planned for the trip. Day 1 – 31 Jan 2014 – Moved out from Singapore to Kota Tinggi, Johor, Malaysia. Camped at Gunung Panti Recreational Forest. Day 2 – 1 Feb 2014 – From Kota Tinggi to Telok Iskandar, Mersing, Johor. Overnight at Kassa Inn. Day 3 – 2 Feb 2014 – From Mersing to Nenasi, Pahang. Rested at Nenasi Motel. Day 4 – 3 Feb 2014 – From Nenasi to Sepat Beach, Kuantan, Pahang. Camped at the beach. Day 5 – 4 Feb 2014 – From Sepat Beach to Telok Chempedak, Pahang, Malaysia. Overnight at RZ Guest House. Clocked in a total of 356.7 km since day 1 to day 5. 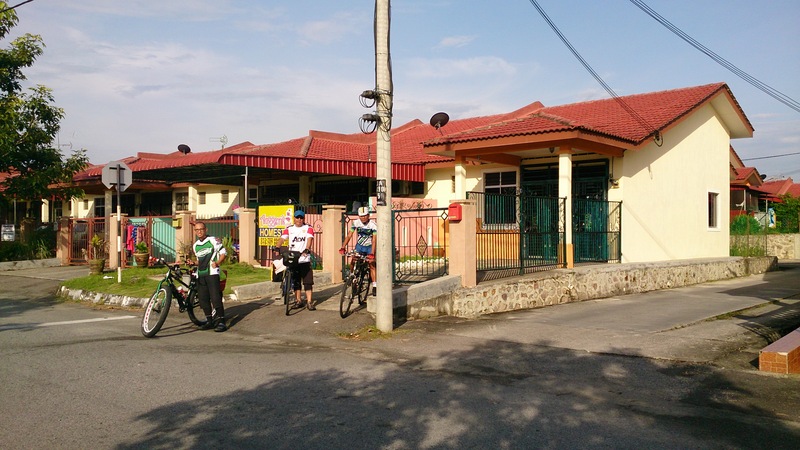 Day 6 – 5 Feb 2014 – From Telok Chempedak to Kuala Rompin, Pahang. Homestayed at Anjung Suri Puspanita. Clocked 142.5 km. Day 7 – 6 Feb 2014 – From Kuala Rompin to Air Papan, Mersing, Johor exploring new routes. Homestayed at Sri Delima Chalet. Clocked 68.5 km. Day 8 – 7 Feb 2014 – From Air Papan to Ulu Tiram, Johor. Homestayed at Teratak Bonda Homestay. Clocked 126.6 km. Day 9 – 8 Feb 2014 – From Ulu Tiram to homeland, Yishun, Singapore. Clocked 42 km. I would like to personally thanks Bro Zaini Abdullah, Bro Acid Mustafa, Bro Azmi Zakaria, Bro Ezam Ariffin and all the Malaysian people who directly and indirectly rendered us all the assistance during our trip. The more we explore, the more experience we gained … So just keep the pedal rolling, even for a few km… to explore the world ….. Thanks to the 17 warriors namely Morsalim, Syaikhul’Azim, Rasidi Ahmad, Che Rahim, Hanafi, Djasli Janet, Rosli, Joefri AJ, Half Burnt Annuar AJ, Ahmad Biola, Rezal Pudgy, Zyzy, Razif, Ezzat Ben Yahya, Musa Haron, Frederick Fletcher … You all are great! Gunung Tahan is one of my favorite mountains and also one of the toughest I’ve climbed so far. Since taking up the hobby in 2000, I’ve reached the summit 5 times – the last was in April 2009 with Team Santai. Gunung Tahan is the highest point in Peninsula Malaysia standing at 2187 m above sea-level. It is situated in the state of Pahang, within the Taman Negara national forest, West Malaysia. There are 3 routes that you can take to reach the summit. I was also told that some years ago, there were climbers who tried the route from Tasik Kenyir, Terengganu but I could not confirmed the source. However, by looking at the map, it should be possible but definitely the journey would be longer than the current routes and experience climbers are required. So far, I’ve tried the following routes. If you want to experience the best, this is one mountain that I highly recommend. You do not have to be a seasonal climber to conquer Mount Tahan, but you definitely have to be mentally prepared. As for your fitness level, it depends on the days you will be taking. You still have to train. I really miss this mountain. I’m thinking of going back again… But this time around, I will bring my eldest son. As for the date, there’s no plan in mind at the moment; but definitely I shall return …..
My Life, My Dream, My Adventures!